The collared finch-billed bulbul has a blue head, white band at the front of the throat and green body. The wings and tail feature a black band at the edges. 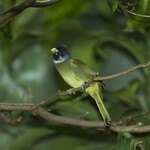 This species can be found in China, Taiwan and Vietnam. This songbird species is common throughout its range. 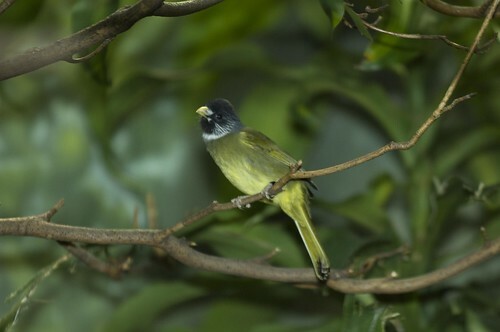 The collared finch-billed bulbul favors hilled forests at moderate elevations. Primarily a frugivore, the collared finch-billed bulbul also eats seeds and insects. This species is typically monogamous. Females build nests in trees in which to lay their eggs.